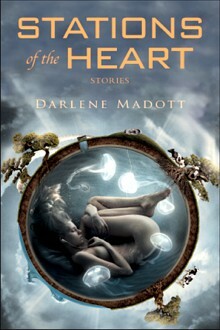 Darlene Madott has a unique way of telling a story, circling, until the moment she slices to the heart. This collection about women and about the men they love and release are stories about personal journeys, about falling, getting up, and persevering – and what is true in all of them, unfailingly, is that the journey is embraced with an open and willing heart, and a fierce determination for joy. – Michelle Alfano is the author of Made Up of Arias (2008), and a co-editor at Descant. Stations of the Heart is a series of personal pilgrimages, about women who take huge risks, travel alone, love solitary men, yet remain open, feminine and vulnerable, whatever their sorrows and betrayals. With quiet intensity and progressive unfolding, what they experience as they carry their crosses from station to station are the almost-loves recognized too late in the rear-view mirror. “We will never meet in Barcelona. One of us will arrive too soon or too late, at the wrong corner, the wrong night.” In the end, Madott offers, like a form of communion, something scarce in our modern times – meaning. The Stations of the Heart collection of stories includes “Waiting: An Almost Love Story,” shortlisted for the Vanderbilt-Exile/Carter V. Cooper Short Fiction Prize, 2012, in the “established writer” category. Please listen to Madott speak with ELQ/Exile about the importance of literary awards such as the "Vanderbilt/Exile Short Fiction Competition" in the You Tube video below. "The $5,000 Vanderbild/Exile Short Fiction Competition"